Researchers from the University of Manchester managed to create elementary magnetic moments in graphene and then switch them on and off. This is the first time magnetism itself has been toggled, rather than the magnetization direction being reversed. They say this is a major breakthrough on the way towards graphene based Spintronics transistor-like devices. 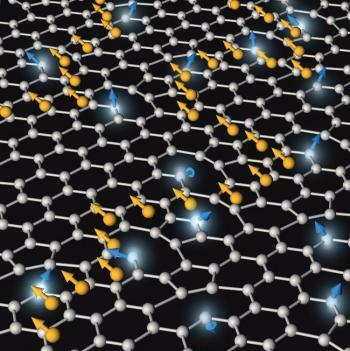 The new research shows that electrons in graphene condense around vacancies ("holes" in the graphene sheet created when some carbon atoms are removed) - and create small "electronic cloud". These clouds carry a spin, and the researchers managed to dissipate and then condense back those clouds. Controlling these clouds basically means a transistor-like device can be made - which uses to store information in graphene. The spin state can be read using an electric current or by using a spin flow. Just last month we reported on researchers from Spain that managed to create a hybrid graphene surface that behaves like a magnet. Seems like graphene is one the leading materials for Spintronics applications.